Shuttle Endeavour's journey to the California Science Center was back on track late Friday after a 90-minute delay that halted the shuttle's crossing of the San Diego (405) Freeway bridge near Manchester Boulevard in South Los Angeles. Shortly before midnight, the shuttle stopped about 100 feet past the freeway near Ash Avenue, where crews will take Endeavour off its lightweight rollers and put it back onto the modular transporters. The switch is expected to take about four hours before the shuttle starts rolling again. It's scheduled to be at Inglewood City Hall at 8 a.m. Saturday and then at the Forum at 9 a.m. The shuttle was set to start the leg of its journey that would take it over the freeway at 10 p.m. Friday, but the trip was delayed due to a faulty tow connection between the shuttle and a Science Center-sponsored Toyota Tundra pulling Endeavour during that leg. At 11:35 p.m., the shuttle resumed its journey, taking about 10 to 15 minutes to travel the few hundred feet across the bridge. Crews said they built extra time into the schedule expecting some snags along the way. "These transitions that we’re doing right now are the tricky things," said Patrick Settles, CEO of Sarens. Despite the delay, shuttle watchers -- who chanted "USA! USA!" as Endeavour rolled by (pictured below) -- said it was worth the wait to see history on the streets of Los Angeles. "You're never going to see this again, ever," said Stephanie Roque. Throngs of shuttle gawkers took in a surreal sight Friday as Endeavour crawled from a hangar at LAX and into South Los Angeles streets, where Southern California Edison crews used cranes draw power lines away from the shuttle's 56-foot tall tail, a task to be repeated several times before Endeavour's journey is complete. 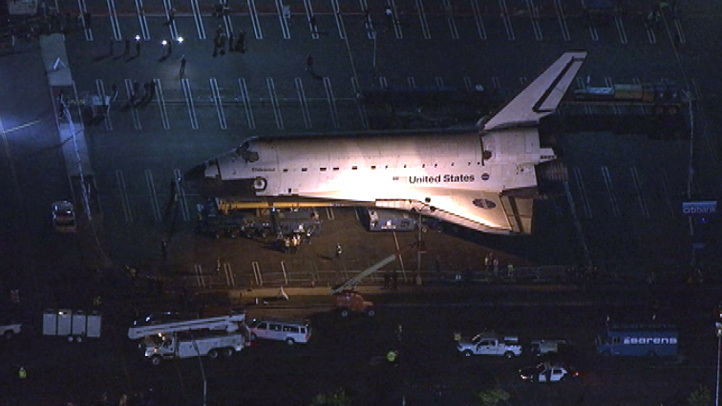 The late-night layover began when Endeavour rested near Manchester Boulevard and Glasgow Avenue on Friday evening while crews transferred the 151,205-pound shuttle to a lighter dolly for transportation over the San Diego (405) Freeway. The shuttle came to a stop at about 4:30 p.m. for a ride swap. Endeavour was scheduled to restart its 2-mph mission to the California Science Center at 10 p.m., though it was closer to midnight when the massive shuttle resumed its crawl. A morning stopover brought the shuttle to a Westchester parking lot about three miles from Los Angeles International Airport. The shuttle arrived at the parking lot -- its first layover point on the two-day road trip from LAX to Exposition Park -- early Friday and attracted a crowd of orbiter enthusiasts. Some of the 700 volunteers working on the project inspected the orbiter, which spanned nearly 20 parking spaces, before it slowly rolled out of the parking lot and back onto surface streets at about 1:30 p.m. The massive shuttle rolled out of a United Airlines hangar Thursday around 11:26 p.m., about half an hour before its scheduled departure time. Endeavour traveled 122,883,151 miles and orbited Earth 4,671 times since its first mission in 1992, but covered just about three miles Friday morning on surface streets en route to the Science Center, where it will become a museum piece. "Everything is really going according to plan, exactly as we hoped for," said Science Center President and CEO Jeffrey Rudolph. "We've still got a long ways to go." People lined streets near the first stretch of the shuttle's route to take in Endeavour, flanked by LAPD officers, as it towered over buildings, street signs and billboards near LAX. The shuttle, built at Rockwell in Palmdale, arrived in Westchester for its nearly nine-hour layover in a parking lot at Sepulveda Boulevard and La Tijera Boulevard at about 5:30 a.m. The Westchester parking lot, adjacent to a Citibank and other businesses, is not considered an official viewing site for the public, but shuttle fans with cameras surrounded the fenced-off piece of NASA history. La Tijera Boulevard will be closed between Sepulveda Boulevard and Manchester Avenue until 5 p.m. The arrival was about an hour later than planned because of trees that required trimming, but officials said they're in no hurry. The shuttle is scheduled to leave the parking lot at about 2 p.m.
"There were three trees that we didn't like the clearance of, so we had to trim those trees," said Ken Phillips, curator at the California Science Center, as he stood in the shadow of the spacecraft. "It's a roll-up-your-sleeves and get-the-job-done feeling." MORE: Submit Your Pics With #ShuttleWatch | How to See Endeavour on "Mission 26"
Part of that job involves clearing transmission lines for the shuttle. SoCal Edison crews will raise lines with cranes to allow the shuttle to pass on some streets in Manchester. "We wanted to make sure we limited our customers' duration of outages," said Marvin Jackman, of SoCal Edison. "So as the shuttle passes through Manchester, we will shut power off, let the shuttle pass through, then put the lines back up and put power back on." Endeavour, which made its last space trip in May 2011, is making its journey to the science center on a NASA transporter pulled by four electronically connected vehicles, a trip that is expected to take more than two days. An operator with a high-tech joystick will walk alongside the orbiter, easing it around corners and positioning the shuttle at its layover points. Enormous crowds are expected, and that raises concerns for both the security of the irreplaceable shuttle and for public safety. Security teams are part of the shuttle's entourage. "It's been through hell," said Phillips. "Twenty-five times it's burned its way back into the atmosphere, you can see the tiles how their scorched and oxidized. Thermally, it's very strong. Mechanically, it's very weak." NASA announced in April 2011 that the retired shuttle -- it completed 25 missions -- would be permanently housed at the Science Center. The return to Southern California is a much-celebrated homecoming for the orbiter, which was built in Palmdale to replace Challenger, which exploded 73 seconds after takeoff in January 1986. Endeavour's first flight was May 7, 1992. It completed its final space mission June 1, 2011. Endeavour arrived at LAX last month after a flight from Florida's Space Coast aboard a modified Boeing 747.